“But you will receive power when the Holy Spirit comes upon you. And you will be my witnesses, telling people about me everywhere–in Jerusalem, throughout Judea, in Samaria, and to the ends of the earth.” These words of Jesus were the last he spoke before he was taken up to Heaven. I am blessed to have been able to go many times now to the uttermost parts of the earth. Tomorrow I will buy airline tickets, and soon I will go to even more uttermost parts than last time. I won’t be specific as to where yet, but I will be in Ethiopia again. Some people say they don’t hear God’s voice. I have to say that I do. Sometimes it’s in the form of thoughts that I know in my knower are the truth. Other times it’s in the voice of someone else, or in dreams, or in things that I read. There are many ways God can speak if you’re listening. But you do have to put away all the busyness of the world around, let the distractions go, and listen for that voice that comes when you’re paying attention. I spoke with God recently, and my first question was, “Lord, am I supposed to go back to Ethiopia?” As soon I asked the question I felt a bit foolish, not because I asked it, but because I asked a question that, had I been thinking about it, I would have already known the answer. The answer I got was, “I have given you many opportunities now; I’ve given you a passion for this, and a passion for people and the gospel. Most of your funds are raised even before you started trying to raise them. I’ve cleared your schedule at the specific time you would need to go. I’ve given you a wife who is supportive of you in all these things. Do you really need to keep asking if you’re supposed to go? I’ll tell you when you’re NOT supposed to go. I’m excited for this trip. Frankly I’ve been excited about all of them except for one, but that’s another story. We’ll be covering some new territory, but also some familiar, and building on the relationships we’ve already established. All the while I will be documenting again, so there will be plenty of pictures. I won’t be specific on places and times until I’m already there, but I will be putting my thoughts down all the while, even if I don’t publish them until later. I learn more about myself than I do about Africa every time I go. I expect this time to be no different, and look forward to sharing what I’ve learned. 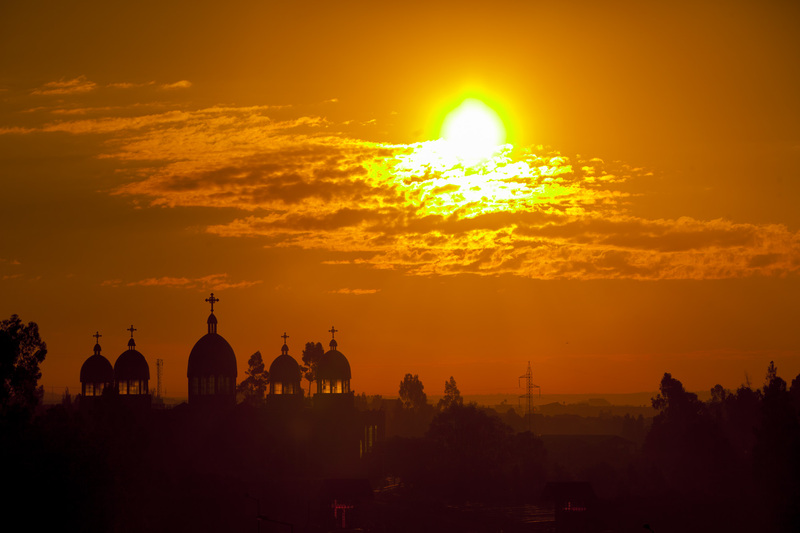 The sun rising over the crosses of an Orthodox Church in Addis Ababa.